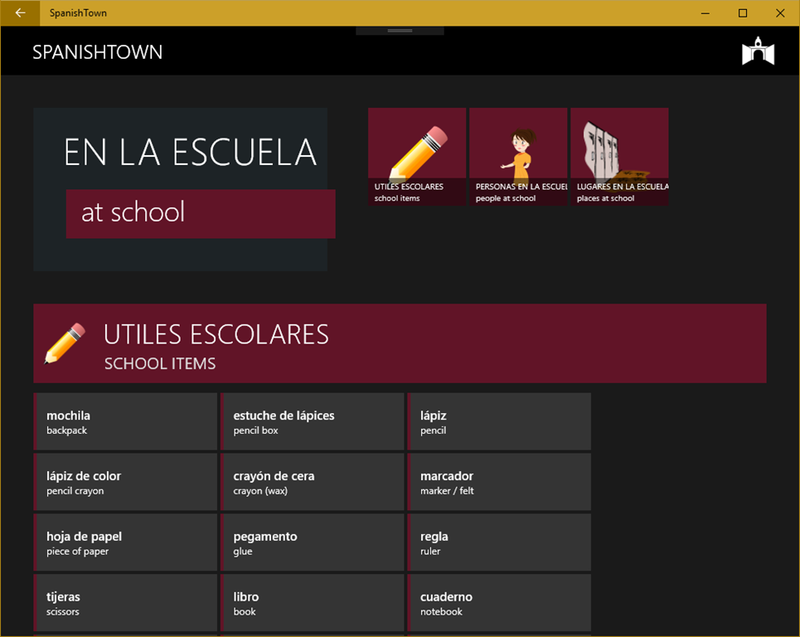 We are very happy to announce that our Windows 10 SpanishTown app is now available across all of your Windows 10 devices including the Xbox One. What is even better is that you only have to buy it once and it will be available on all of your Windows 10 devices: phones, tablets, laptops, desktops, Surface, Surface Hub, HoloLens and now the Xbox One. Download it now for a FREE 7 day trial! Access hundreds of example verbs and full sentences with audio across a variety of different tenses and moods. Practise for the next exam by using our multiple choice quizzes and fill-in-the-blank worksheets which draw on a database of thousands of different questions. We have loaded the app with a large variety of grammar topics that will help you navigate through those difficult areas. 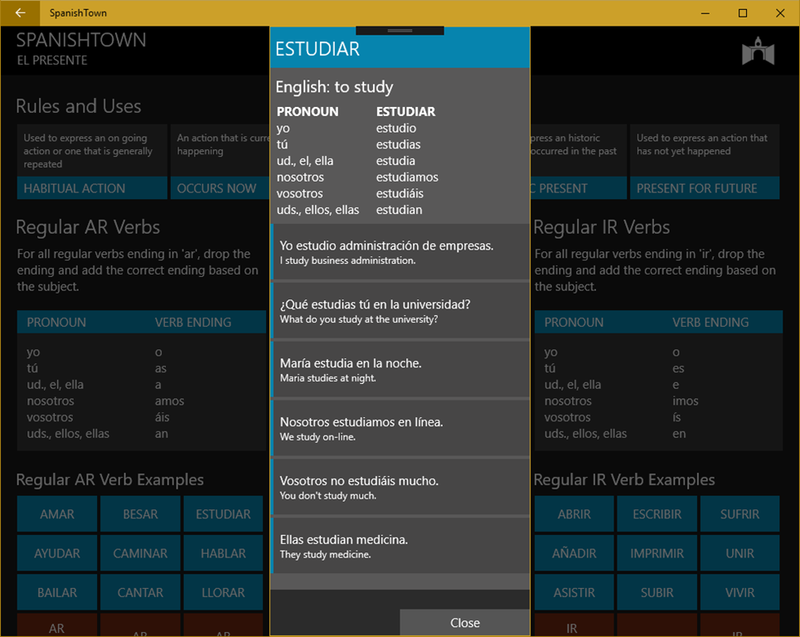 When do you use ser or estar or por or para? What are the rules and exceptions to the gender of nouns? Why is the verb gustar different and why is it so important to understand? 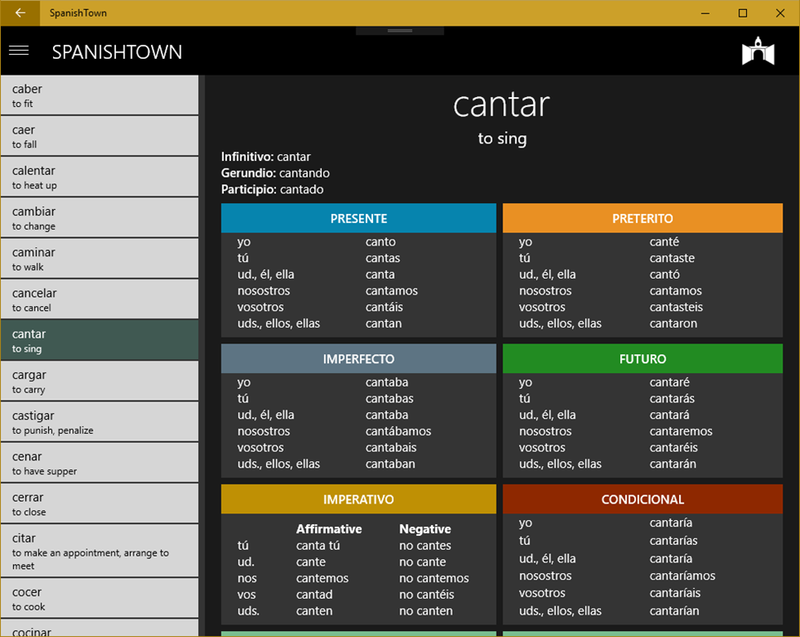 Learn new Spanish words and listen to the pronunciation. 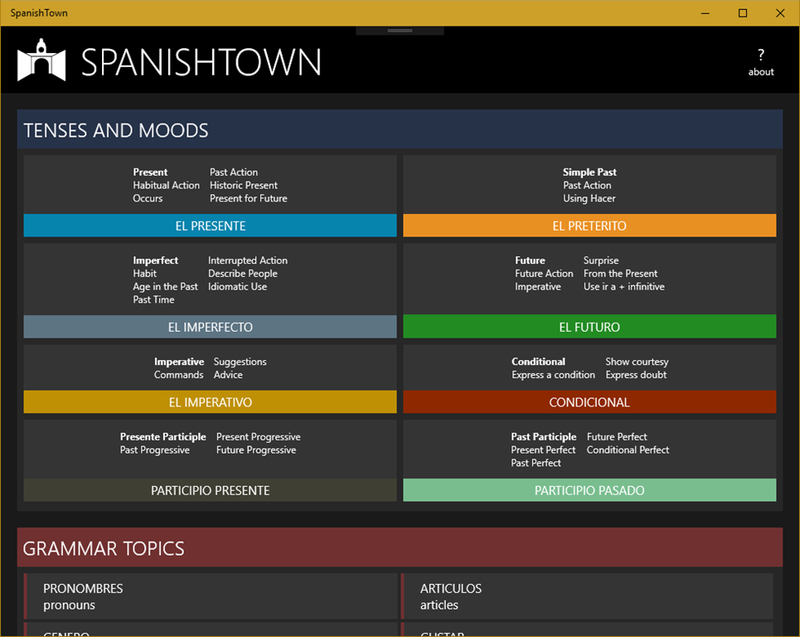 Our vocabulary section is organized by category but you can also search for a specific word either using English and Spanish. We are not a dictionary but we do have hundreds and hundreds of the most common words available, all with audio and the English translation. With over 350 of the most common Spanish verbs available you can look through them, either alphabetically or by using our search feature. 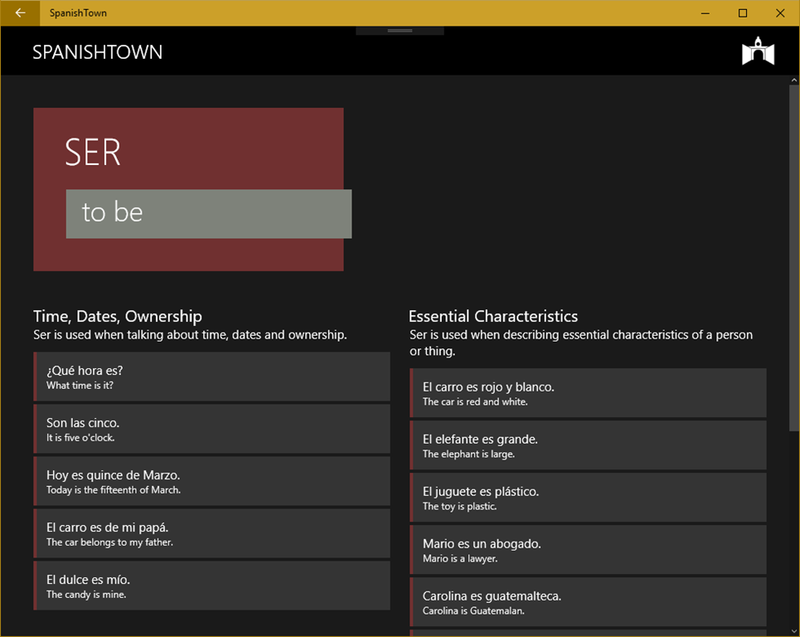 Search using the English verb or the Spanish verb. 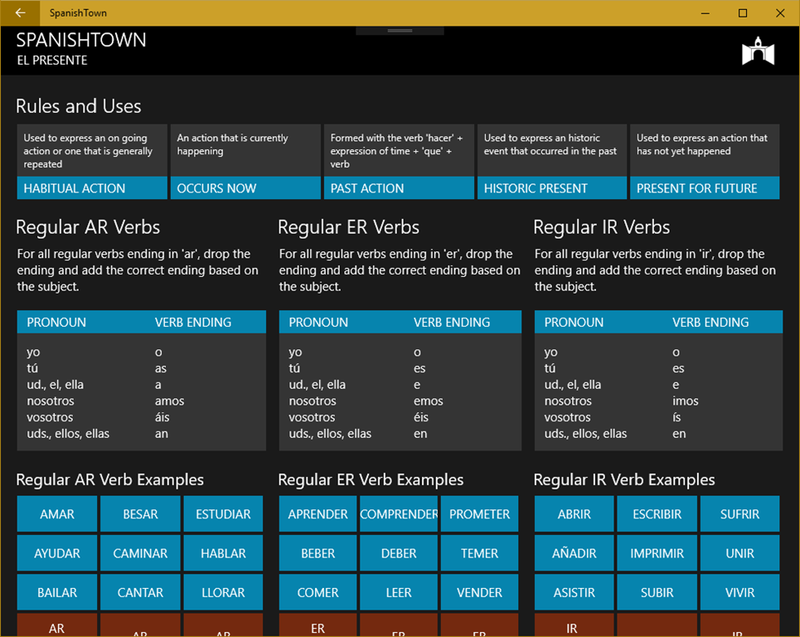 View the verb conjugations for different tenses and moods. Try it now on any Windows 10 device including your Xbox One!